Four Wheel Campers has a set of Intercomp SW-500 racing scales set up on a custom-built platform. The platform and scale pads can be rolled under a camper quickly to determine a dry weight. Over the years we have used Intercomp racing scales to weigh dozens of truck campers from small pop-ups to big triple-slides and are always impressed with the speed and accuracy of the results. 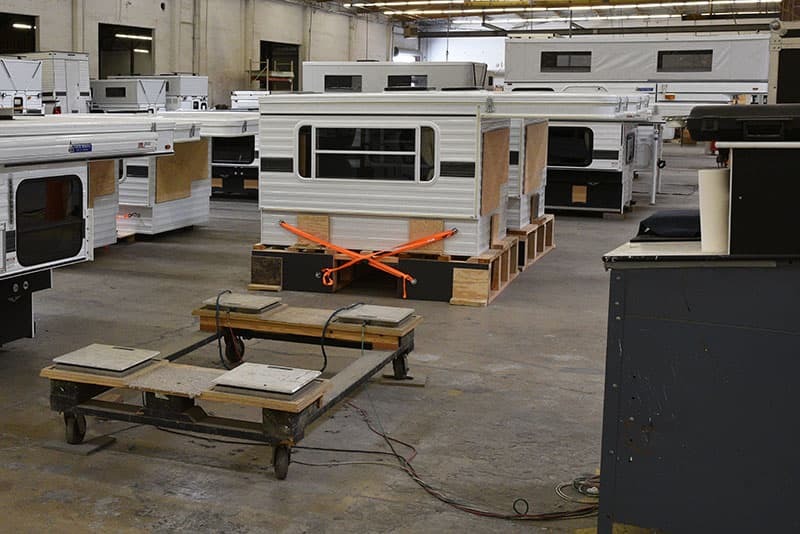 In our opinion, no truck camper manufacturer or dealer should be without an Intercomp racing scale system for accurate weights and customer weight requests. The SW-500 wired system shown above starts at under $1,000. A wireless scale system is around $1,700. Either way, the investment is minimal compared to the importance of the information these scales provide. Since we have witnessed Four Wheel Campers using their own scale system, we can vouch for the accuracy of their stated dry weights. Thank you, Four Wheel Campers. What makes me uncomfortable is the fact that the Hawk comes in four different floor plans, but Four Wheel Campers publishes only one official dry weight for the Hawk. 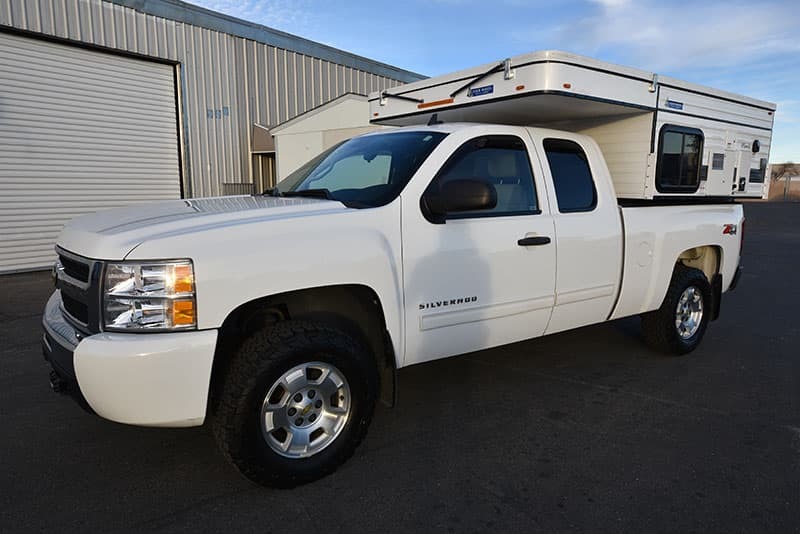 While we don’t expect the four floor plans to vary significantly, we do expect the different floor plans to be different weights and would like to see that information provided by Four Wheel Campers. 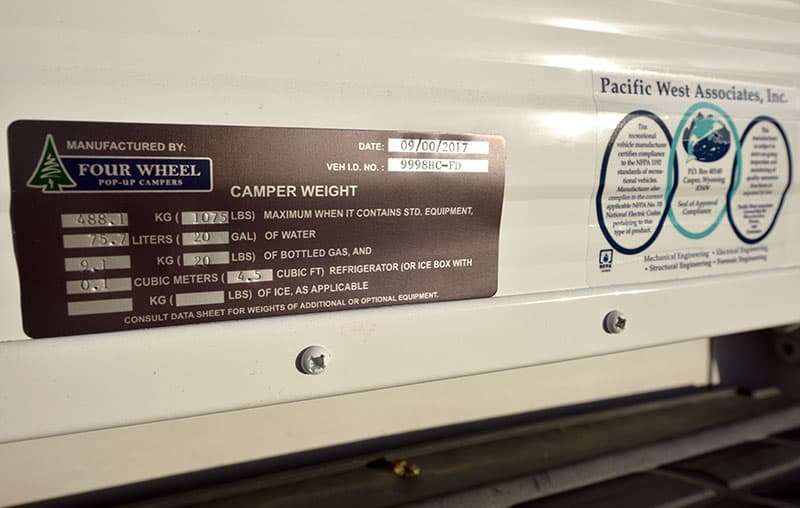 Furthermore, we would like to see Four Wheel Campers weigh each and every camper that leaves the factory and document that dry-with-factory-installed-options-weight on the unit itself. We also want to encourage Four Wheel Campers to clearly mark the center of gravity on every truck camper. All of this is in line with the safety-first position that Truck Camper Magazine promotes in every truck camper review. Side Note: Four Wheel Campers talked about this point in their Manufacturer’s Response to this Hawk review. Let’s assume the 1,075 pound dry weight is accurate for the Four Wheel Camper Hawk with the Front Dinette Seating floor plan. To that weight we need to add any options installed at the Four Wheel Camper factory or dealership. For example, the option weight on the Hawk review unit is approximately 241 pounds bringing the total dry with option weight to 1,316 pounds. I will cover this in more detail for the Wet Weight Calculation. 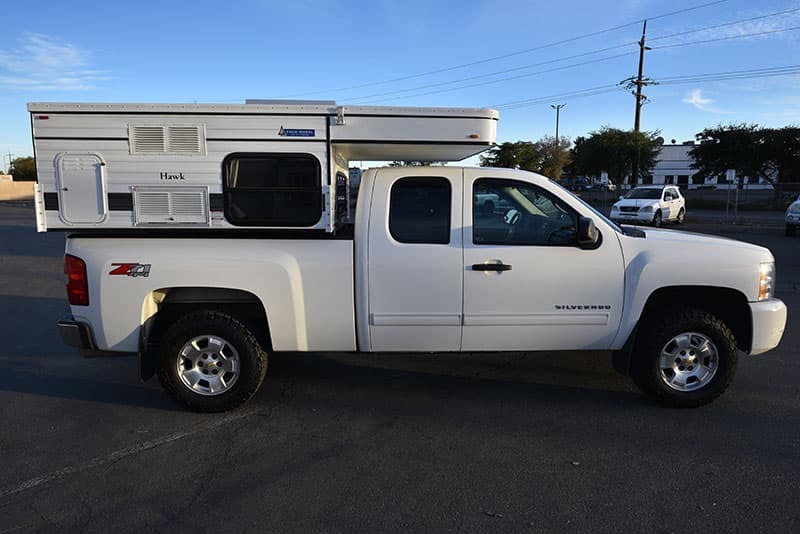 With an 80-inch floor length and a 128-inch overall length, the Four Wheel Camper Hawk is among the shortest production pop-up truck campers available. The shortest production pop-up is actually the Four Wheel Camper Swift at 70-inches of floor length and a 111-inch overall length. With a pull-out cabover that extends into the camper, the Four Wheel Camper Hawk maintains an overall length of just 128-inches. That effectively means you get a North-South cabover size in an East-West overall length – a really neat trick! Owners can also choose not to extend the cabover and just have a normal East-West bed. The cabover versatility in this camper is fantastic. Interestingly enough, the width of the Hawk is also 80-inches making the main living area a square box. At 80-inches, the Hawk is not the narrowest pop-up. The Four Wheel Camper Swift (and some units) are narrower. It’s important to note that the Swift is designed for mid-side trucks like the Toyota Tacoma while the Hawk targets full-size short bed trucks. With 6’6” of interior height and no upper cabinetry, the Four Wheel Camper Hawk is wide open and spacious inside. I stand at 6’3” and was very comfortable standing and moving about in the Hawk. Climbing into the cabover, I was not able to fully sit up, but that’s a typical limitation for a pop-up design. Four Wheel Campers reports the center of gravity on the Hawk at 32-inches. We would like to see this delineated for each Four Wheel Camper floor plan, but it’s not likely to change too much. At 32-inches, the center of gravity should be forward of the rear axle on all full-size short bed trucks. 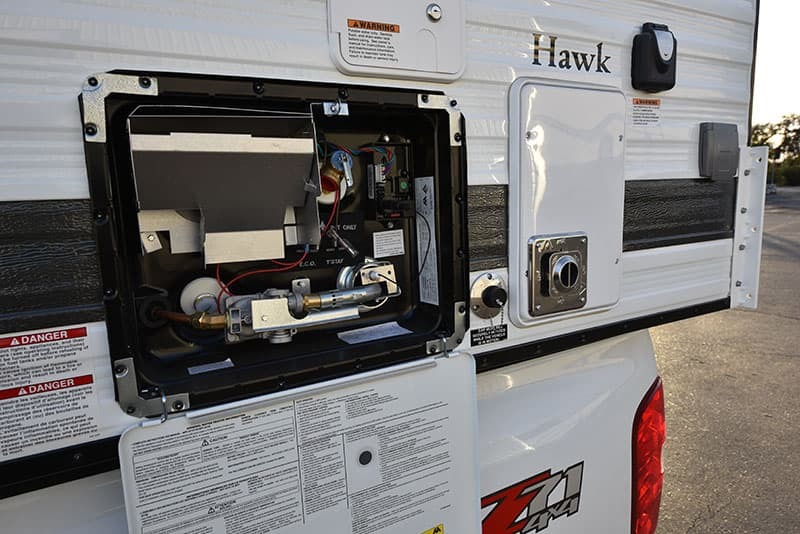 While not industry leading, the 20-gallon fresh tank in the Hawk is very competitive for a short bed full-size pop-up truck camper. Limiting the fresh tank to 20-gallons also helps to keep the wet weight of the Hawk down and maximizes its potential compatibility with short bed half-ton trucks. 20-gallons is also a lot of water for a truck camper that lacks a bathroom, built-in toilet, and shower. The only standard feature on the Hawk that taps the fresh water capacity is the kitchen sink. You can wash a lot of hands and dishes and brush a lot of teeth with 20-gallons of fresh water. If you add the optional 6-gallon water heater and outside shower package, your total onboard fresh water supply jumps to 26-gallons. The only way 26-gallons of fresh water could be a limitation would be if you take a lot of outside showers (or order the Hawk with the optional interior shower). 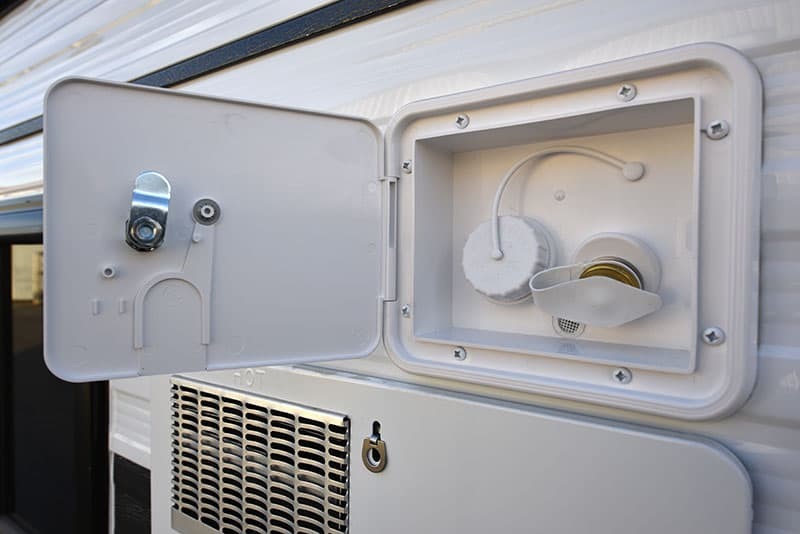 Since most pop-up camper owners are very conservative with their water use, it’s more likely that the 20-gallon or 26-gallon fresh water capacity will last upwards of a week, or more. Probably more. There is no grey water holding tank on a Four Wheel Camper. Grey water from the kitchen sink (the only internal grey water source) is captured via an external portable grey water tank. There is no black tank available for the Hawk, unless you opt for the Hawk Flatbed model (which offers an optional cassette toilet). That’s right, Four Wheel Campers makes a flatbed Hawk with a side entry, a rear face-to-face dinette, and an optional inside shower. That’s another camper, for another review. The only truck camper manufacturer who uses 10-pound propane tanks is Four Wheel Campers. 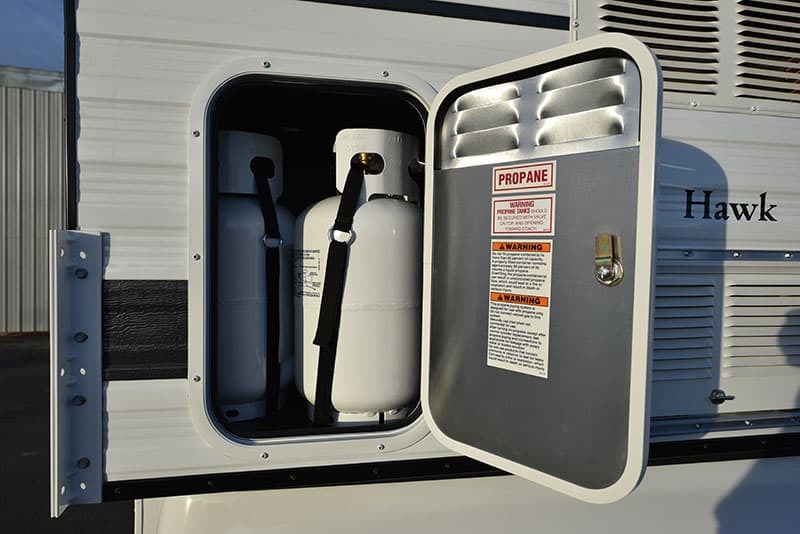 The obvious advantage of 10-pound propane tanks is that they are lighter to lift and maneuver and are more compact to fit into the Four Wheel Camper design. 10-pound tanks can be refilled at propane filling stations but cannot be easily exchanged 24-hours a day and 7-days a week like 20-pound vertical tanks. For this reason, we hope that future Four Wheel Camper design moves toward 20-pound vertical tanks. The Hawk comes standard with one Group 24 AGM battery. The Hawk under review had two Group 24 AGMs. With the minimal power requirements of this camper, two Group 24 batteries is likely overkill. Unless you’re looking to run the furnace for multiple days (furnace fans are notorious power hogs), or need to charge some power hungry devices (like the MacBook Pro I’m typing this on), start with one Group 24 AGM battery and add another when needed. Since it cannot be overstated, the non-ventilated battery compartment in the Hawk requires sealed AGM batteries for safety.